Do you like to use sea salt or table salt? Comments for Sea Salt or Table Salt? We've compared the flavor of sea salt verses table salt in boiled peanuts over many batches. When boiling peanuts we have not found a noticeable difference in the taste of peanuts boiled with off the shelf sea salt compared with table salt. If you use sea salt that's course ground then you should add more salt by volume because it is less dense than fine ground salt. Hawaiian boiled peanuts are typically made with local white sea salt and star anise. Local salts contain unique mineral blends that will affect the taste of the salt. If you have access to exotic salts it might be worthwhile to experiment. Certainly many specialty salts taste unique. We've not tried them with boiled peanuts. No doubt they are expensive. The question is a matter of taste and cost. 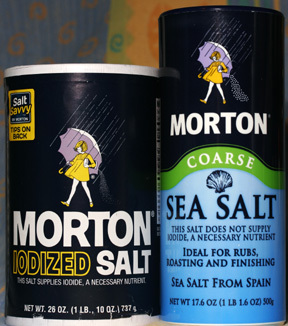 Grocery store sea salt cost many times the price of table salt. On the other hand if sea salt is available to you at a favorable price, why not use it? In our experience there is no significant difference in taste either way with typical grocery store salts. I have found out over time, its better to add salt, after the peanuts have finished cooking. It takes several hrs longer cooking time if not. Very interesting observation, thanks for adding that. I've boiled both with and without salt, but as I use a pressure cooker I can't say I've noticed a big difference. Maybe I wasn't paying close attention. I'll have to run a controlled experiment. Anything that reduces boiling time is a good thing, as long as the results are good. Using a pressure cooker reduces cooking from many hours into minutes. I plan to create a pressure cooker page here, as they are very useful when boiling dried peanuts at altitude (we're at about 5,800 ft. above sea level). I noticed in the following video from the Pelion Peanut Party that they boil without salt, then soak the boiled peanuts in saltwater for a couple of hours. I had assumed it helped control the consistency of the boiled peanuts over many batches, but based on your observation it would reduce cooking time as well.